Be transported to the wild orange groves off the coast of South America in a cup of this brilliant citrusy and exotic floral blend. Brimming with a symphony of melodic succulent flavors such as juicy oranges, soft marigolds, hibiscus and rose petals, this deliciously sweet green oolong tea ends with a lovely lyrical floral note. Wonderful, served scorching or iced. Be transported to the wild orange groves off the coast of South America in a cup of this bright citrusy and exotic floral blend. 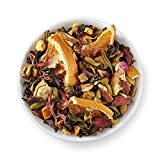 Brimming with a symphony of melodic succulent flavors including juicy oranges, soft marigolds, hibiscus and rose petals, this deliciously sweet green oolong tea ends with a lovely lyrical floral note. Wonderful, served hot or iced.